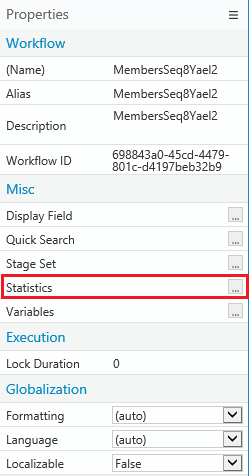 Use the statistics feature to collect business-process related statistical information gathered from workflow components, both native and external, and metadata. Access App Studio > Properties panel > Misc section. Next to Statistics, click the three dot button. History Interval Time interval for which statistical data is collected. Expression Editor Define the statistical expression manually or use the Fields section and Functions section to add expression components. Click Validate to validate your statistic.